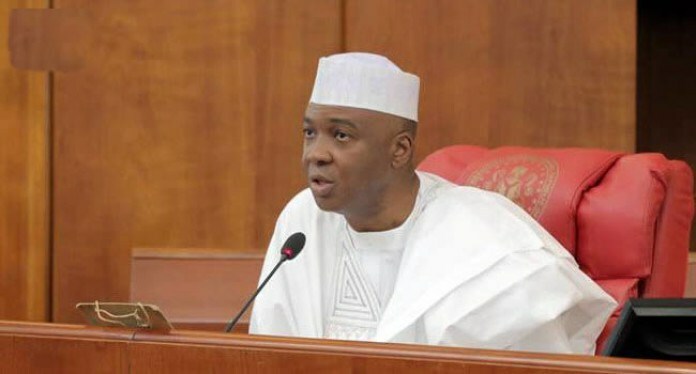 As the 2019 general elections draw nearer, Senate president, Bukola Saraki is considering throwing a shot at the presidency - Saraki told Bloomberg that he's considering running for the highest political office in the country - He will be running against the incumbent president, Muhammadu Buhari, if he wins the PDP's primary ticket Senate president, Bukola Saraki, is said to be considering to run against President Muhammadu Buhari in the 2019 general elections. According to Bloomberg, Saraki said in an interview at his residence in Abuja: "I am consulting and actively considering it. I believe I can make the change. “The PDP has learnt its lesson from the loss in 2015, and I think unfortunately the APC did not learn from their victory. "We have the opportunity with the right kind of presidential candidate and president to provide the leadership for the party. The party has a good opportunity to lead the country in the right direction.” NAIJ.com notes that the Senate president said if he decided to run, he would run on the platform of the Peoples Democratic Party (PDP). According to him, he would have to win the PDP's primary ticket in October 2018, to run against the incumbent president. Meanwhile, NAIJ.com previously reported that the Senate president Bukola Saraki urged President Muhammadu Buhari as a matter of urgency to probe the siege laid to the National Assembly on Tuesday, August 7 by the operatives of the Department of State Services. Saraki in a tweet on Tuesday, August 14, on the siege, said that the serious questions about the siege on the National Assembly could only be answered through a thorough and neutral investigation.